What is a Window Cleaner Tulsa : Water Fed Pole? A water fed pole is a pole used by a professional window cleaner tulsa. Here at gleaming glass, we use a water fed pole. So give us a call at 918-850-9798. This kind of pole has many sections. These sections extend out, and clamp down to form a longer pole. This allows the window cleaner to reach high windows. The end of a water fed pole has a brush to scrub the glass. The brush also contains 2 spray nozzles. There are two popular types of pole materials used in the window cleaning industry. The most popular material used as carbon fiber. Carbon fiber is the most expensive of the two, but is also the strongest. The other material used is fiberglass. Fiberglass is quite a bit cheaper however, it flexes a lot. Flex is not good while cleaning windows. In addition, there are also two types of brush materials used. The first, and most common type of brush, utilizes nylon bristle filaments. Nylon is a good scrubbing material for glass, however it’s not the most aggressive. The most aggressive brush scrubbing material is Hogs hair. Hogs hair brushes are by far the best at scrubbing dirty glass. When buying a water fed pole and brush, you also need to consider jet nozzles. Just like brush and pole materials, there are two main types of spray nozzles. Window cleaning supply companies offer pencil jets and fan jets. Pencil jets are great for hydrophilic glass. Fan Jets should be used when rinsing hydrophobic glass. Hydrophobic glass is glass that repels water. Hydrophilic glass tends to attract water to its surface. Hydrophobic glass causes water to beat up and roll down the glass. Whereas hydrophilic glass causes the water to sheet down the surface of the glass. Window cleaning with a water fed pole is much easier on hydrophilic glass. There are many safety advantages when cleaning with a water fed pole. The main safety advantage being you don’t have to get on a ladder to clean windows anymore. Homeowners and contractors across the world get injured on ladders every day. I’m a window cleaner Tulsa business owner so I’m well connected in the window cleaning industry. I hear of a window cleaners falling off ladders all of the time. Ladders are incredibly dangerous. A water fed pole keeps window cleaner Tulsa business owners off of ladders. There are also many time-saving advantages to using a water fed Pole. The initial time required to take the water fed pole out of the truck is minimal. All you need to do is take the pole out, and unroll the water hose. While these are extra steps that you would not have had to take if you were using ladder; the amount of time it takes you to clean the window is worth it. In addition to the time saving advantages, there are also Financial advantages. Hypothetically, a window cleaner in Tulsa could fall off of a ladder, and he would have high medical bills. If the same window cleaner had bought a water fed pole, he would not have fallen off the ladder. This window cleaner would have saved tens of thousands of dollars by purchasing a water fed Pole. It’s more expensive short-term, yet saves you money in the long run. How can the window dry spot free? Water fed poles allow you to scrub the glass and then rinse the dirt off the glass. The window cleaner does not have to squeegee the water off of the glass. This is possible through the scientific breakthrough of pure water window cleaning. Pure water window cleaning is cleaning windows with water that has no contaminants. This is accomplished through the use of a wide array of window cleaning filters. These customers tap water is connected to these filters, as a result pure water is produced. This is what allows the water to dry on the window Spot Free. Many window cleaning water filters are used to remove the contaminants in the water. The first filter the water travels through is a sediment filter. This removes physical debris that you can see with your eye. The water then moves through carbon filters, reverse osmosis filters, and then finally deionization filters. These filters remove the stuff you can’t see in the water, with the human eye. This is a common debate among Tulsa window cleaners, and window cleaners around the world. Is a squeegee better, or is a water fed pole better for window cleaning. Furthermore, they like arguing about which one is the best tool to use for window cleaning. Rather than arguing, window cleaners should be using both tools on different windows. Every tool is useful for different tasks. Not every tool can be used to accomplish the same outcome with a given task. Can a homeowner buy a water fed pole? Homeowners can clean with a water fed Pole too. There is a company called reach it that makes a pole specifically for homeowners. Finally, homeowners can clean their windows like a professional too. The window cleaning pole that reach it sells, is a fiberglass pole with a reach of 20 feet. It comes with 30 feet of tubing for your water, and can cleaned up to two stories. Whenever you collapse the sections, you are left with a 6 foot pole. 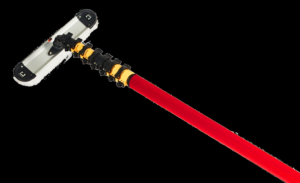 If you would like to buy your own window cleaning Pole, Google future of cleaning. You will find a company called reach it where you can buy your pole from. Contact a window cleaner tulsa company. First of all, google tulsa window cleaning. As a result, all of the window cleaning companies in Tulsa will appear in the search results. Furthermore, you will be able to read the reviews of every tulsa window cleaning company. Especially relevant, you will be able to see how many more reviews gleaming glass has compared to the competition. We are currently sitting at 14 five star Google reviews. In conclusion, click on our company and visit our instant estimate page. There you will be able to get an instant window cleaning estimate.